The study appears in the Aug. 29 issue of the journal Cell. An internal circadian body clock helps virtually all creatures synchronize their bodily functions to the 24-hour cycle of light and dark in a day. However, travel to a different time zone, or shift work, disrupts the body’s clock. Furthermore, it can take up to a day for the body to adjust to each hour that the clock is shifted, resulting in several days of fatigue, indigestion, poorer cognitive performance and sleep disturbance. 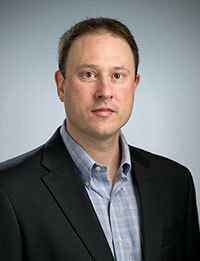 Giles Duffield, associate professor of biological sciences at Notre Dame and a member of the University’s Eck Institute for Global Health, and Kevin Flanagan, a University alumnus and now a doctoral student at Washington University in St. Louis, characterized the protein SIK1, revealing that it plays a pivotal role in preventing the body from adjusting too quickly to changes in the environment. Duffield and Flanagan, along with researchers from University of Oxford and F. Hoffmann La Roche, and led by senior research scientist Stuart Peirson at the Nuffield Department of Clinical Neurosciences, identified roughly 100 genes that the body switches on in response to light, initiating a series of events that help to retune the body clock. They identified one gene and its corresponding protein product, called SIK1, that limits the body clock’s ability to adjust to changes in the daily patterns of light and dark. In one particular experiment, when the researchers blocked the activity of SIK1 in laboratory mice, the mice adjusted faster to changes in the light-dark cycle that mimic a time zone change. The study proposes that the light-stimulated production of SIK1 in turn switches off the molecular pathway that feeds into the clock mechanism, thereby halting the shifting response of the biological clock. “Our key contribution to the project was to manipulate the SIK1 protein pharmacologically, and we revealed that such blockage of the protein’s activity in combination with exposure to a natural clock resetting agent, such as light, enhanced the clock shifting response,” Duffield said. “For example, a one-hour shift of the clock became two hours. We also showed this effect in both peripheral tissues as well as in the clock in the brain. In addition to the inconvenience of jet lag, disruptions in the circadian system, such as produced during shift work, have been linked to many diseases including diabetes, heart disease and cancer. Disturbances of the circadian clock have even been linked to mental disorders, such as schizophrenia, bipolar disease and seasonal affective disorder, also known as winter depression. It is important to note that approximately 16 percent of the U.S. and European workforces undertake some form of shift work. “Having such a hand-brake on the circadian clock systems makes sense so as to prevent excessive responses to environmental change, and that it is only in our modern 24-hour society, with Thomas Edison’s light bulbs, Nikola Tesla’s electricity and jet airplanes, that we begin to realize our biological limitations,” Duffield said. The researchers’ identification of the role SIK1 plays in the body clock offers a tractable target for drugs that could help travelers adjust faster to changes in time zone and help ameliorate the effects of rotational shift work. “The fact that it is a kinase enzyme makes it an attractive target for the design of novel therapeutics,” Duffield added. Flanagan worked on the project as an undergraduate student, and wrote an honor thesis on his research data and presented his work at the Society for Research on Biological Rhythms meeting in 2012. “Being involved in this project as an undergraduate student and presenting my data at an international conference really crystalized my interest in scientific research as a career,” Flanagan said. The Wellcome Trust, F. Hoffmann La Roche and the National Institute of General Medical Sciences funded the research. 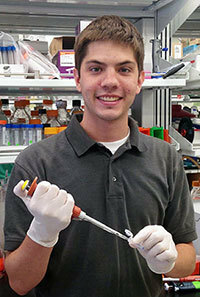 Flanagan’s participation was funded by a National Science Foundation Research Experiences for Undergraduates (REU) grant.